(Nanowerk News) Chemically coated, ceramic implants successfully guided the regrowth of missing bone in lab animals while "steadily dissolving," researchers report. Surgeons and scientists at NYU School of Medicine and NYU College of Dentistry say their implanted scaffolds were naturally absorbed by the test animals' bodies as new bone gradually replaced the devices. 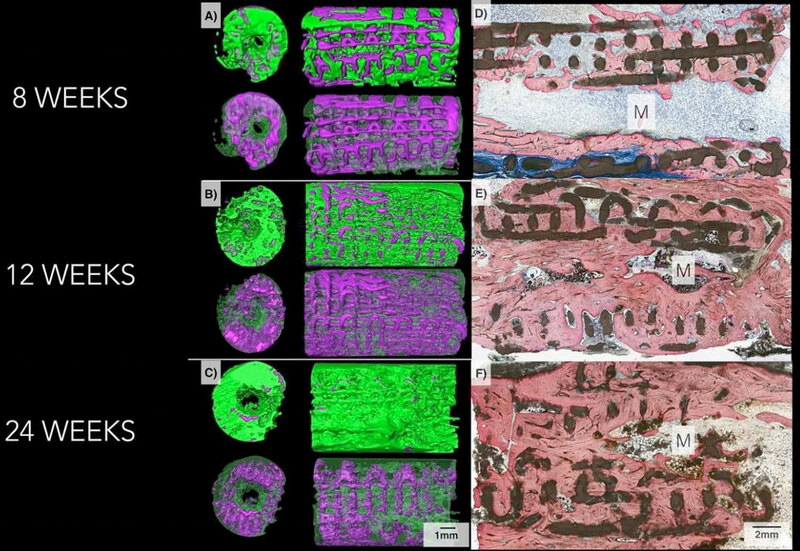 The research team describes its progress in a series of reports, the latest of which appears in the Journal of Tissue Engineering and Regenerative Medicine ("Form and Functional Repair of Long Bone Using 3D Printed Bioactive Scaffolds"). Modeled after the bone pieces they are meant to help replace, the implants were assembled onsite using 3D robotic printing, a technology that uses a fine-point print head to push out a gel-like ink material. The material is printed onto a platform, and the printer repeats the process until 2D layers stack up into a 3D object, which is then superheated into its final ceramic form. Available for more than a decade, the technology has only of late been applied in medicine to print out replacement ears, skin, and heart valves. "Our 3D scaffold represents the best implant in development because of its ability to regenerate real bone," says study senior investigator and biomedical engineer Paulo Coelho, DDS, PhD. "Our latest study results move us closer to clinical trials and potential bone implants for children living with skull deformations since birth, as well as for veterans seeking to repair damaged limbs," adds Coelho, who is the Dr. Leonard I. Linkow Professor at NYU Dentistry and a professor in the Hansjörg Wyss Department of Plastic Surgery at NYU Langone Health. The scientists say their novel ceramics more closely resemble real bone shape and composition than other experimental bone implants in which plastic elasticizers are added to make the implant flex. Although the ability to flex offers some advantages, the plastic does not have the same healing ability as NYU's scaffold. An important feature of the ceramic devices is that they are made of beta tricalcium phosphate, a compound of the same chemicals found in natural bone that makes the implants resorbable. One of the secrets to the rapid growth of native bone with the NYU devices is a coating of dipyridamole, a blood thinner shown in other experiments to speed up bone formation by more than 50 percent. The chemical also attracts bone stem cells, which spur the formation of nourishing blood vessels and bone marrow within the newly grown bone. These soft tissues, researchers say, lend to their scaffold-grown bone the same flexibility as natural bone. "Dipyridamole has proven to be key to the implant's success," says study co-investigator Bruce N. Cronstein, MD, the Dr. Paul R. Esserman Professor of Medicine at NYU School of Medicine, who perfected the drug's use during device testing. Used for more than a half-century to prevent blood clots and treat stroke, dipyridamole has a long-standing safety record, says Cronstein, who also serves as the director of the Clinical and Translational Science Institute, and chief of the Division of Translational Medicine at NYU Langone Health. "And because the implant is gradually resorbed, the drug is released a little at a time and locally into the bone, not into the whole body, thereby minimizing risks of abnormal bone growth, bleeding, or other side effects." In the latest experiments, researchers used the test scaffolds to repair small holes surgically made in the skulls of mice and missing bone pieces as long as 1.2 centimeters in rabbit limbs and jaws. The scientists found that on average 77 percent of each scaffold was resorbed by the mammal's body six months after implantation. They also found that new bone grows into the lattice-like structural supports of the scaffold, which then dissolves. Some CT scans of the implant sites showed almost no trace of beta tricalcium phosphate, the 3D-printed material of which the original implants were made. Subsequent weight-bearing tests showed that the new bone was of equivalent strength as original, undamaged bone. The investigators say their next studies will test the scaffolds, for which they have a patent pending, in larger animals. They caution that clinical trials are still several years away. Related efforts in skull reconstruction moving forward will be led by plastic surgeons Eduardo D. Rodriguez, MD, DDS, the Helen L. Kimmel Professor of Reconstructive Plastic Surgery at NYU Langone Health, and chair of its Hansjörg Wyss Department of Plastic Surgery; and Roberto Flores, MD, the Joseph McCarthy Professor of Reconstructive Plastic Surgery, who also directs NYU Langone's cleft lip and palate program.